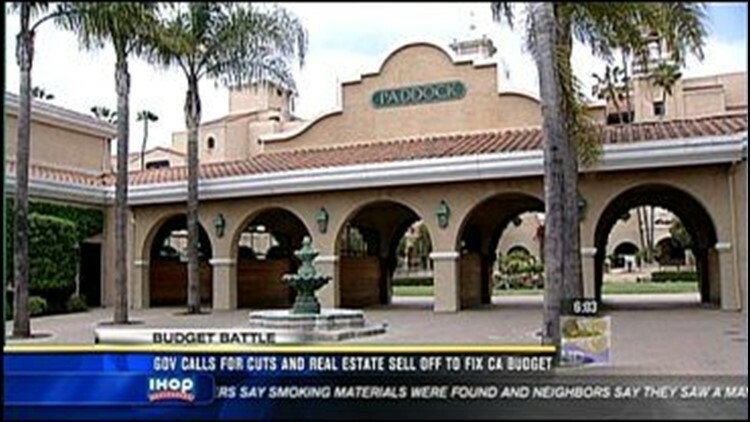 As part of Governor Schwarzenegger's revised state budget plan the Del Mar Fairgrounds could be put up for sale to help resolve California's budget woes. According to an article in the Union Tribune, selling the 400-plus acre state-owned landmark, along with others across the state could bring in as much as $1 billion. The state currently has a budget deficit of $15 billion. It could jump to $21 billion if voters reject the propositions in Tuesday's May 19 special election. county's first agricultural fair. Horse racing was introduced on the site in the 1930s to help fund the fair. Meanwhile, Schwarzenegger said Thursday that thousands of state employees must be laid off and billions of dollars must be slashed from the budget to deal with a deficit that tops $15 billion and could widen again within days. "I understand that these cuts are very painful and they affect real lives," Schwarzenegger said during a news conference. "This is the harsh reality and the reality that we face. Sacramento is not Washington - we cannot print our own money. We can only spend what we have." The state approved billions in budget cuts and revenue increases earlier this year but they were not enough to keep up with a sharp drop in tax revenue as the recession batters the state's economy. California still faces a deficit of $15.4 billion in the fiscal year that starts July 1. That will grow to $21.3 billion if voters reject budget-related measures during a special election next week. The Republican governor released budget proposals that account for both deficit numbers and call for across-the-board cuts that will strike at the core of state services. Starting Friday, the administration will send layoff notices to 5,000 state government employees, a move that is designed to cut the general work force by 5 percent but would take months to complete. Funding for health and human services and the higher education system also would be cut. If voters reject the ballot measures next week, as polls indicate they are inclined to do, education will be cut by a total of $5.4 billion and the school year will be shortened by 7.5 days. Schwarzenegger said that will lead to teacher layoffs and larger class sizes. Under the larger deficit, Schwarzenegger also proposed transferring illegal immigrants in the state prison system to federal custody. His budget proposal will go to the Legislature, which has until June 15 to pass a spending plan, although the constitutional deadline is rarely met. Critics said the governor was releasing his "May revise" budget proposal ahead of time as a scare tactic to persuade voters to support the special election ballot measures, nearly all of which are trailing in the polls. "This is a desperation move," said Mike Roth, spokesman for the No on 1A campaign, which opposes a proposition that would create a spending cap and extend a series of tax increases. Schwarzenegger and lawmakers called for the special election in February when they passed a two-year budget package, which they said at the time would solve California's deficit through June 2010. That budget included $15 billion in cuts, $12.8 billion in temporary tax increases and $11.4 billion in borrowing, but it has not been enough. The Legislature's nonpartisan budget analyst warned recently that California could run out of cash as early as this summer. Assembly Speaker Karen Bass, D-Los Angeles, said the drop in tax revenue was so severe that she couldn't fathom how next year's budget could be balanced with cuts alone. "I think that voters frankly are going to be outraged if the initiatives fail when they see the type of cuts that are in store," she said. The governor wants to sell state property, including the Los Angeles Memorial Coliseum and San Quentin State Prison, to raise $600 million to $1 billion over the next two to five years. His plan calls for $6 billion in borrowing and, under the worst-case scenario, taking $2 billion from local governments, a move that would affect local police and fire departments. "This goes to the very heart of our communities," Schwarzenegger said. "But these are the numbers, and they don't lie." The recession has taken a deep toll on California, which relies heavily on income tax and capital gains from the wealthy to fuel its government. The state's unemployment rate has jumped beyond 11 percent, the construction industry is in a tailspin and the retail landscape is dotted with empty storefronts. Personal income has fallen statewide for the first time since 1938, leading to a sharp drop in tax revenue.